What are little boys made for? Laughter and mischief and lazy afternoons by the pool wearing one of our boy swimwear. Hyperactive kids need durable boy swimwear that allows maximum movement while providing ample protection. Made from premium fabric with elastane, our boy swimwear outfits are kid-friendly and ready to rumble. In eye-catching colors accented with cute graphics, these swim trunks are designed for a comfortable fit so that your little sweethearts can spend hours splashing in the water and horsing around nonstop without chafing. When it comes to swimwear, Brazilianbikinishop.com knows that style and function are equally important. Let your boys be the joyful kids that they are with comfy boy swimwear. Find the perfect Boy swimwear to make your young man look awesome at the beach. 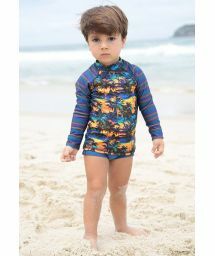 The bold colors, playful patterns and original designs of our Boy swimwear match his style and complement his personality.